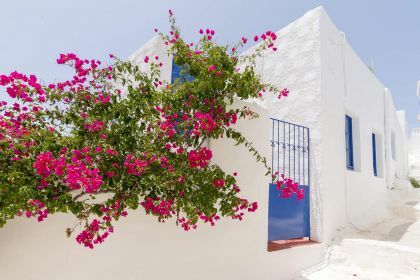 With its rugged coastline, dramatic ruins, scent of pine forests, and windmills twirling in the breeze, Leros truly offers an idyllic Greek island experience. According to Greek mythology, Leros is the island of Artemis, the goddess of forests and hunting. Suitable then that it boasts stunningly fertile valleys and rolling green hills — just what the doctor ordered for city-stressed vacationers. Kick back and relax to the sounds of gentle waves lapping against the hull of your luxury yacht as you drop anchor and revel in Leros’s hidden bays and coves. 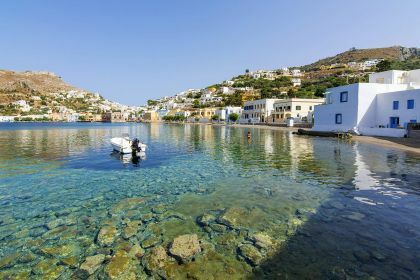 Leros is simply idyllic for yachting holidays. Cruise around the island in your luxury yacht, and stop off at one of the many anchorage spots. Find your own private hideaway and enjoy the some sublime sun bathing and frolicking in the waves. Leros is a paradise for scuba divers. Not only does if offer rich marine life but if you enjoy wreck dives, then you’re in for a special treat. The island played a role in the Second World War and was once home to an Italian Naval base. Underwater wrecks include planes, anti-submarine nets, landing-craft and, of course, shipwrecks. 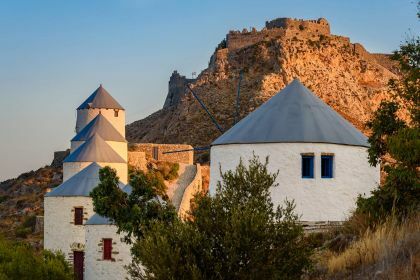 And if you’re a lover of ancient history, don’t miss Pandeli Castle or Kastro Panteli towering above the island. If you visit it only for the views, it’s worth it — the 360-degree panoramic views of fishing villages, bays and luminous water are magnificent. Leros is a small island but it has many exquisite beaches. Sandy Vromolithos beach, Gourna beach in the west and Alinda in the east are particularly lovely. There are a multitude of eateries on Leros, serving fresh fish and seafood and other culinary delights, be they small, waterfront tavernas, found at practically every beach around the island, or more upmarket restaurants. Don’t leave the island without sampling the mouth-wateringly delicious cheese pie with honey or tuna pastrami and fried small shrimps at Taverna Dimitris o Karaflas. Other recommended restaurants include Ostria restaurant, Zorbas Taverna and Restaurant Mama Veta. 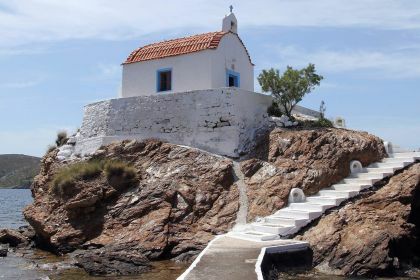 Insider tip The tiny Saint Isidoros Church, northwest of the island, is one of the quaintest churches in the whole Aegean. Perched on a rock in the sea, with a narrow walkway leading to it from the land, it is extraordinarily photogenic. There are no locks on the chapel door so feel free to go in and light a candle. Insider tip 2 While a visit to Pandeli Castle is a must, the walk there can be rather strenuous. We recommend you take a taxi there and walk back — and don’t miss the scenic row of the windmills on the way down.